With fall weather about to be upon us, I'm getting in the mood to knit again. I happened to grab a Fall 1995 issue of Vogue Knitting from my mother's archives and was surprised to be reminded of just how God-awful fashion from this decade was. 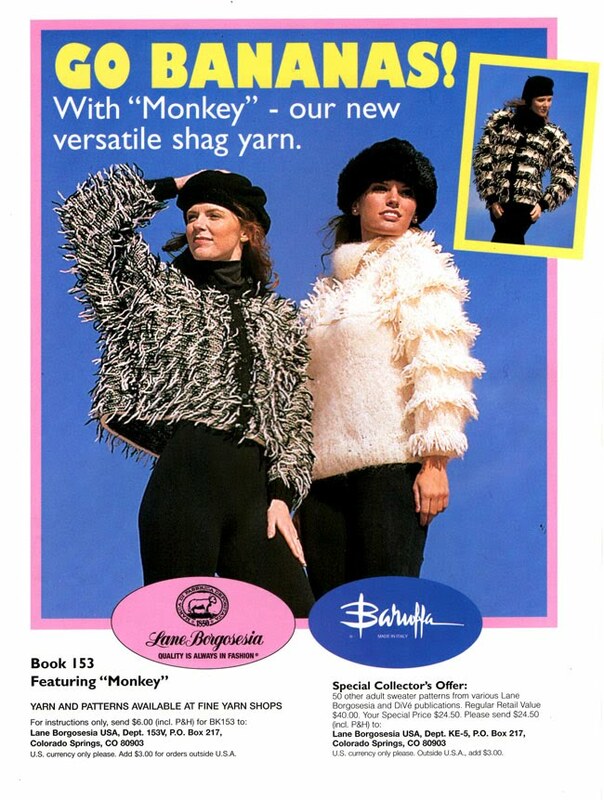 If you thought the bulky sweaters, big shoulders and gawdy patterns of the 80s were long gone by the mid-90s, then someone forgot to give that particular memo to the yarn and pattern manufacturers that advertised in this issue. 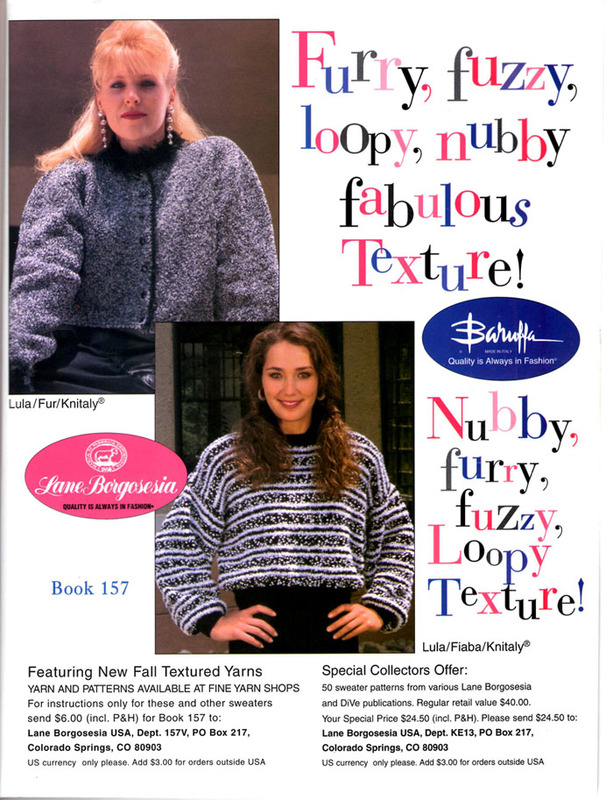 Ironically, the actual Vogue patterns in the book aren't all that bad - just the advertising. It isn't that often that I cover much from the 90s decade, so crank up your Salt-N-Pepa CD and brace yourself. I never thought it was possible to ruin mohair yarn until I saw this ad. The first two women are doing a pretty good job pretending they actually enjoy wearing ridiculously oversized fuzzy sweaters with animals and farm landscaping on them, but not that blonde model. Her smile is not quite as perky as the others. She looks like she's ready to kill the booking agent who put her literally into this fuzzy mess. 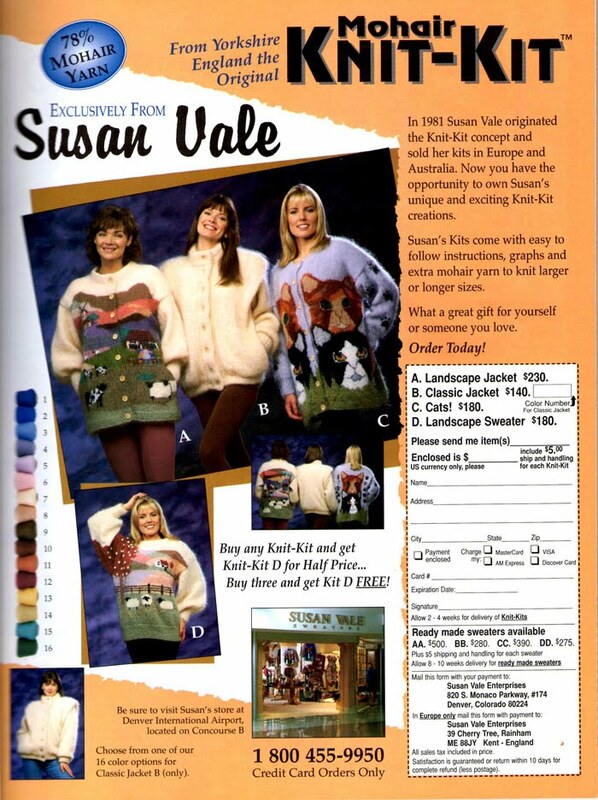 I wouldn't recommend wearing any of these sweaters on a date, especially the Crazy Cat Lady pattern. They'll kill an erection faster than you can say "Elena Kagan." Matching couples sweaters are bad enough, but "Mommy and me 4ever" matching sweaters is a little creepy, as in "Mommy plans on keeping you with her forever and ever." They forgot "absolutely nucking futs." More like Oh, Brother. Who the heck wants to go stepping out looking like a member of the British royal family, circa 1982? These are the reason why people have "ugly sweater" parties. As much fun as I had in the 90s (and I have a friggin' blast), the clothing was horrendous. I think even then I thought it was pretty ugly. Remember Jane Mancini on Melrose Place? She was supposed to be this "cutting edge" designer and often made things like those horrible floor length flower dresses that you wore with a clip in the back and a little tee shirt underneath. Remember those? Blech! The best fashion movement in the 90s was the return of flannel, because it was the only un-ugly item allowed. And even that wasn't so hot. I have to say it again though, great decade for me! I loved a lot of it, especially the music! Oh God, I do remember those dresses because I wore a couple of them like that (with a tee underneath.) I wasn't a fan of the "grunge" look, either. 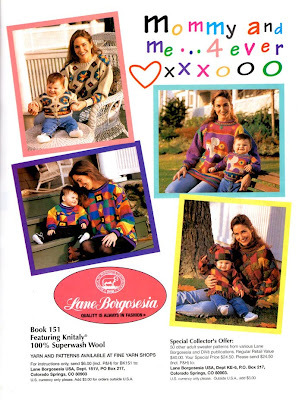 I loved when my mom used to knit me sweaters in the 70s and 80s. I wish that I had kept them all. 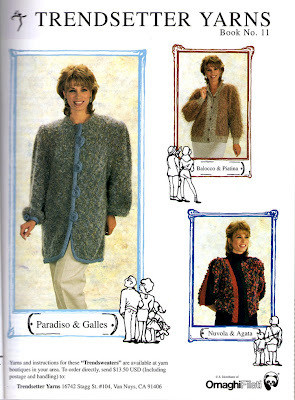 One of my favs was a blue one that she also made in other colors for my friends Suzy and Jenny in 79 or 80. She tried teaching me to knit a couple of times but I had trouble learning to do so. My Aunt Al taught me to crochet and I was doing okay with that but I gave up on it. I still have the hooks that grandma got me in the early 80s though. I guess that I didn't get the family craft genes. Retro Hottie of the Month: Ricky Gervais!